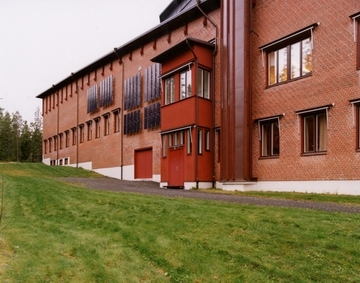 Summary When the project with this ecological museum started in the autumn of 1993 it was decided that a solar heating system should be installed on the roof and a PV system on the south façade. During the first four years 6261 kWh was produced. This is about two thirds of what can be expected from a façade system. This is much due to the shadowing caused by the nearby trees. The trees are located to the west in front of the modules and cause shadowing during the afternoons. After discussions with the neighbour house owners it was decided that only a minor part of the trees that had to be cut down in order to obtain a shadow free situation should be cut down.